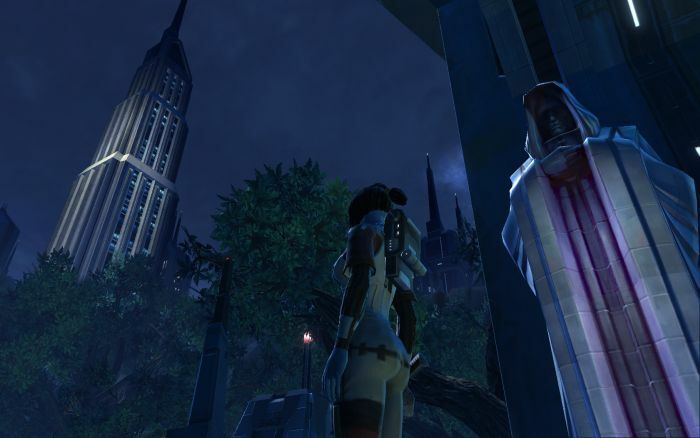 Exploring Cybertech Crafting #SWTOR – Nomadic Gamers, eh! There has been a lack of blog posts lately, I know. It’s that time of year when everyone is busy with their holiday cheer – and me? I’ve been playing SWTOR. In fact I’ve surprised myself with how much I enjoy the game. I didn’t follow it through development at all, I had no idea what any of the classes were, how crafting worked, or any other details. My Imperial Agent is now level 11, and I’m done with Hutta (but I’m still there at the moment, farming crafting supplies). I ended up choosing Cybertech and the two ‘harvesting’ skills that are suggested to go with it, scavenging and underworld trading. Guild mates have chosen a few of the other craft categories, and we are trying to round things out as much as possible. Crafting is.. weird. Your character doesn’t technically craft, your companion does. In fact even though you can train your crew skills at level 1, you can’t open the crafting window until you have a companion. Your companion goes away on these crafting missions (leaving you with a moment of peace, alone for once) and returns with supplies – or without. Crafting missions cost a bit of coin, consider it a fuel cost. The more your companion likes you, the higher chance they’ll come back with something useful. So far my companion is not that fond of me. Our personalities don’t mesh at all and she frowns at a lot of the choices I make in conversations with NPC. I know you can gift them items to increase your standing with them, but that costs money and I don’t really see the need at this moment. Cybertech creates items like droid armor, earpieces, grenades, armoring, and mods. So far I’ve made a few mods, and one of the final items I received before leaving Hutta was a new weapon with four mod slots. I quickly headed over to the machine used to mod pieces, and made use of the crafted items I had been making. While I have technically been playing SWTOR as a ‘single player’ game, I do belong to a guild with a handful of friends and I fully believe that it is up to the players to decide whether they play the game single player or otherwise. I’ve grouped up for some of my more difficult quests, and I expect as I level up I’ll continue to do so. When I don’t want to play with others I have the option to remain solo, which I’ll admit, is quite refreshing. I’m looking forward to starting my class quests, and moving on from Hutta. While the zone was good at introducing me to the world, it’s also very dismal and brown. I could use a change of scenery. @Ryver — I have a schematic for a vehicle on my Cybertech character. Not that I’ve built it becuz I got one from my Collector’s Edition so there’s been no need. But I could if I wanted to. . . . I also can make the available “Grade 2” ship mods as well and tricked out my ship. Makes the missions considerably easier. Cybertech is also useful for building mods for my up-and-coming Sage. At level 11 you can start buying moddable light armor “social clothing” and since a Sage uses light armor and I like how it looks and can simply build 2 of the 3 mods each piece uses on my Cybertech and then use the commendations you seem to get a ton of to buy the “enhancement” mod from the vendor. . . . well, let’s just say that my squishie little mage tends to have 20% more HP than the tanks in the groups she’s been joining lately. Plus she gets earpieces at the level they become available and she had a helmet at level 11 to boot. Works nicely. Now I’m thinking I want to make a Shadow and have it be a tank in a Slave girl outfit or something. . . . .
Loving SWTOR. Thought my time with MMO games was over – but the whole class story and your game feel is great. Funny thing is that I find myself grouping more than ever now. I am very much the type of gamer who hates being forced to dungeon crawl just to get something out of a game. I don’t know about your experiences, but I am finding people a little different in game than other MMOs I have played. It could be the new game factor I guess, but in general players seem a lot more willing to help each other. I get random outside heals a lot when doing open area quests, and even had random players come to my aid when I got into a fight with a droid that was way above my ability. Could this be the power of Star Wars and the Jedi ethos unconsciously seeping from players? After 6+ years of EQ2 – it feels good to have a crafting system without a silly mini game bolted on. I have pretty much concentrated on gathering resources at the moment though and there are various harvestable nodes dotted around as you get further into the game, this makes gathering skills faster and cheaper to level. @ Ryver – You are correct about making ship upgrades. I have a blueprint for a ship weapons upgrade that requires level 80 in Cybertech to make. Cybertech is pretty cool. If torhead is to be believed, later you can make ship parts and even personal vehicles. Underworld trading I believe allows you to send your companion out to collect gifts. So of those you can then turn around to give to your companion. You do not need to head to those little tables to change our the mods on your gear. You can CTRL+Right_click on a piece of gear anywhere and swap mods out. If you want to keep the prior mod (to deconstruct? ), just right click it to remove from it from your gear (costs some credits) then add your new mod. Otherwise, the new mod overwrites the old one.